You'll be hard-pressed to find a more reliable payout than Enterprise Products Partners, and it's currently yielding 7%. Check out the latest Enterprise Products Partners earnings call transcript. When the market drops like it has over the past couple of months, it tends to punish indiscriminately. While that can mean some OK businesses are selling for incredibly cheap prices, it can also mean that great companies are selling for decent prices. Times like this can be a great opportunity to buy high-quality businesses at much more attractive valuations. One company that has been swept up in this recent stock decline is Enterprise Products Partners (NYSE:EPD). Enterprise is one of the best-run oil and gas pipeline, processing, and logistics businesses in the U.S. with a history of steadily rewarding shareholders. 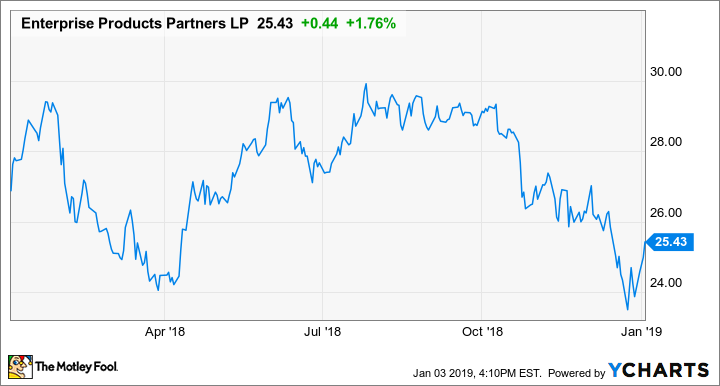 Even though Enterprise is a great business to own over the long haul that pays a large distribution to its investors, its stock has been dragged down low enough that it currently sports a distribution yield of 7.1%. A yield that high for a business this strong seems almost too good to be true. So let's take a look at what investors can expect in 2019 to see if maybe there are some concerns we may be overlooking. Back in 2017, Enterprise's management made a daring decision. It told investors that it was going to slow the rate at which it grows its payout. The decision to slow this growth rate was to retain more of its operating cash flow over time and reinvest it in the business. Management called this "self-funding the equity portion of its capital funding." This is jargon for saying it will use its own cash flow and debt to cover its capital spending rather than issue new units of the master limited partnership for funding purposes. Enterprise's decision to retain more cash flow likely came down to three factors: 1) With a high distribution yield, issuing units was a relatively high cost of capital; 2) Its debt load was creeping up; and 3) It had a lot of capital spending projects to build. With so much cash expected to go out the door for growth, it made sense to keep that cash and not run into the problem of having too much debt or being reliant on issuing shares to pay for those projects. That decision was well timed because it expects to complete several projects in 2019. According to management, Enterprise will bring $4.5 billion worth of new projects into service in 2019, including some needle-moving assets like two Permian-to-Gulf-Coast crude oil pipelines, a petrochemical manufacturing plant, and a new petrochemical export facility. This wave of spending from 2017-2019 was unprecedented and will represent a significant increase in annual EBITDA. 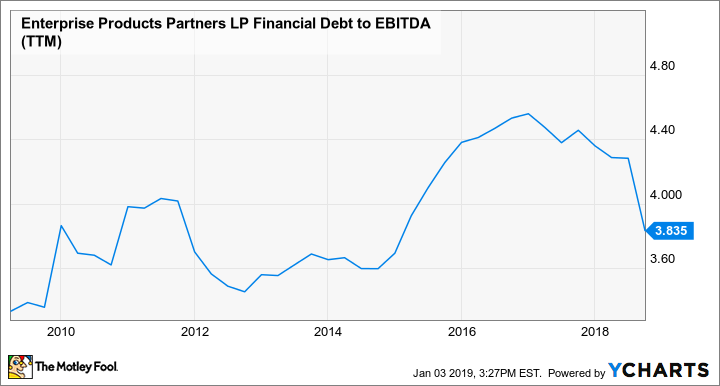 Management anticipates that all of these projects going live will lower its leverage -- measured as debt to adjusted EBITDA -- to 3.5 times, the lowest level in five years. Some investors may have soured on Enterprise Products' stock when management asked they accept a slower payout growth rate. For those willing to hang on, though, it appears that their patience will be rewarded. After this wave of spending is done -- total projects going live in 2020 is a more modest $1.4 billion -- management intends to re-up its commitment to its investors. On top of talking about returning to mid-single-digit distribution growth, management has said in numerous investor presentations that it intends to consider unit -- the partnership equivalent to stock -- repurchases. This would be a considerable change for an MLP. A steady diet of unit repurchases over time could go a long way in making it easier for Enterprise to grow its per-unit payout. Companies that have used share repurchases over the long haul have made it much easier to achieve per-share dividend growth. In 2019, investors won't likely see much improvement as Enterprise Products puts the finishing touches on this large slate of capital projects. Afterward, though, cash should start flowing back into their pockets. No one is going to be blown away by a payout growing a quarter of a penny every quarter, as Enterprise Products' has for more than a year, but management has made a commitment to increasing its payout every quarter. It has done so for 57 consecutive quarters and its annual payout growth streak is close to Dividend Aristocrat territory. What is more important, though, is that investors can reasonably expect this payout to increase once this wave of projects goes live over the next 12 months. Since more than 85% of the company's revenue comes from fee-based services, there is little concern that all these new assets will be affected by the recent downturn in oil and gas prices. Considering where its yield stands today, the company's rock-solid business -- and prospects for even better paydays in a little over a year's time -- makes Enterprise an incredibly attractive stock that investors should seriously consider buying now and holding for years.